« Best Poker Rap Video Ever? The Lady is a Champ! 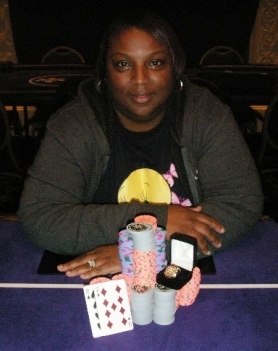 New Orleans, LA Ã¢â‚¬â€œ The eleventh of fifteen scheduled events at the 2008 Bayou Poker Challenge concluded today as Daphne Turner won the $500 buy-in No-Limit Hold’em competition. The tournament was hosted by the Harrahs New Orleans Casino and Hotel. First place paid $34,920. Ms. Turner was also presented with a gold ring, awarded to all World Series of Poker Circuit winners here in the Crescent City. Turner’s victory established several milestones. First, she became the first female to ever win an open WSOP Circuit tournament in the five-year history of the Bayou Poker Challenge (Note: “Open” events mean those tournaments which are open to all players). She also became only the sixth female to accomplish this feat nationwide since the WSOP Circuits began four years ago. Turner’s victory was truly remarkable, considering she has no previous record of cashes in a major poker tournament of any kind. Turner is a 39-year-old bill collector. She lives in Richmond, Texas Ã¢â‚¬â€œ which is near Houston. She destroyed everyone sitting at what was her first final table ever. Turner personally busted eight of her nine adversaries in a three-hour performance that can only be described as overwhelming. What does her race add to those milestones? I’m really curious. Of course you do, suburban lily white-boy. Though I haven’t checked the numbers, I can almost guarantee you she is not the first ethnic minority to win. When I first saw who the winner was, I WAS surprised that she was a black woman. It isn’t because I’m a dirty racist. It is because there just aren’t a large number of black people in general playing in poker(tournaments). My answer is, “Not really”. Unless you really believe that the color of your skin or nationality or gender limits you on how well you can play poker, why should it? Maybe I’m crazy but I believe that if the poker community were more evenly split among the races/gender/nationality, that no one specific group would dominate any of the others. What it is, to me, is a historical bookmark. Take the Main Event again. There was a first European. There was a first Asian. There will be a first woman. There will be a first black. Personally I don’t give a damn until its the first me.